Resplendent with white-washed walls, coal black roofs, horse head eaves, and a level of ornamental decoration befitting a palace, the buildings that flank the Old Street of Tunxi Old Town are some of the finest in Anhui province. 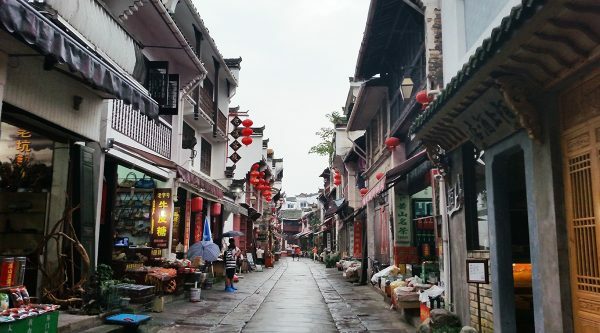 This street, one of the last remnants of a bygone area, sits at the centre of Tunxi District in Huangshan City and was originally established during the Song Dynasty (960-1279). Though a handful of buildings reflect this dynastic style, the most famous ones were built during the Ming (1368-1644) and Qing (1644-1912) dynasties. It all began when Emperor Huizong of the Song Dynasty moved his seat of government to the city of Lin’an (modern-day Hangzhou) and commissioned droves of architects and workmen to help build his new capital. Several of them came from Tunxi and, when they finally returned home, they chose to imitate the style of architecture that they had seen in Lin’an. After all, imitation is the sincerest form of flattery! At the beginning of the Ming Dynasty, in a bid to expand the town and add to his growing wealth, a local Hui merchant invested money into building 47 stores along Tunxi’s Old Street. This helped open up the town to trade with businessmen from neighbouring provinces and, by the Qing Dynasty, the town had become one of the major distribution centres for the ancient region of Huizhou. The town is truly a testament to the old saying; you have to spend money to make money! Nowadays many of these old stores have retained their original characteristics and maintain the traditional layout of “shop in the front and living quarters in the back”. Many of these buildings are between two to three storeys high and are beautifully decorated with Hui wood carvings and red lacquered shop signs. The street itself starts in the west at Zhenhai Bridge, which was built during the Ming Dynasty, and ends at the magnificent Memorial Archway in the east. It is about 1.5 kilometres (1 mi) long and is paved by stunning rust-coloured flagstones that have been worn smooth by centuries of use. There are even two delightful museums along the street. One, known as Tunxi Museum, has a plethora of Ming and Qing dynasty artefacts on display, as well as a charming exhibition of paintings, calligraphy, and porcelain on its second floor. The other, known as Wancuilou, is a privately-owned, four-storey affair with famous examples of the Four Treasures of the Study (the writing brush, ink stick, ink stone, and paper). These ancient, elaborately carved calligraphy articles will surely put your ballpoint pen and notepad to shame! The street itself is teeming with all kinds of shops, some of which have been plying their wares for over one hundred years. A variety of curios, such writing brushes, delicately carved ink stones, and locally picked tea, can all be found within this tiny slice of ancient China. A few examples include Tongderen, a Chinese medicine store, Tonghe, a steelwork store, and Chengdexin, a sauce and pickle makers, who have all operated on the street for over one hundred years and still use the same, archaic methods of production. Just off of the main Old Street, but still within Tunxi Old Town, you’ll find the households of the Cheng family. These gorgeous mansions were built in the traditional Huizhou-style during the Ming Dynasty and have stood tall for centuries.